This page provides a description as well as simple testing methods for each of the parts and components related to an electric dryer. All tests should be preformed with the dryer unplugged and all wires connected to the part being tested unplugged. The dryer’s thermal fuse is a non-resettable safety fuse that is designed to break electrical contact to the dryer’s heater if the dryer becomes too hot. This fuse will often burn out due to clogged dryer ducting or a defective cycling thermostat. The thermal fuse along with a broken door switch is the most common cause of electric dryers that will not start. Test: How-To Test A Dryer Fuse Video. Disconnect all connecting wires and check for continuity across the two wire contacts. There should be no resistance measured (a closed circuit, allowing electricity to flow). The hi-limit thermostat is a safety switch that will break electrical contact to the dryer’s Heating Element if it senses that the dryer has become too hot. The hi-limit thermostat will cycle the dryer’s burner or heater off if the ducting has become clogged blocking proper airflow. Symptoms are usually a very short heating cycle with a low drum temperature, or no heat at all. The hi-limit thermostat is a fairly reliable dryer component and is rarely the cause of dryer heating problems. Test: Disconnect all connecting wires and check for continuity across the hi-limit thermostat or sensor set. The dryer’s thermal cut-off is similar to the thermal fuse and the high limit thermostat. It will break electrical contact to the dryer’s burner or heating element if it senses that the dryer is reaching an unsafe temperature. The thermal cut-off is a set of two thermostats, one of which will not reset once cool. The thermal cut-off needs to be replaced as a set. If this set of dryer parts fails you will need to check your dryer and home ducting for clogging. And check to make sure that the dryer’s cycling thermostat is operating properly. This type of safety thermostat does not just fail for no reason. If the non-resetable fuse has blown out, you need to check and clean your ducting! Test: Disconnect all connecting wires and check for continuity across the terminals. The thermal cut-off should be closed (allowing current to flow) at room temperature. The cycling thermostat is responsible for cycling the dryer’s heat source on and off to keep a target temperature, set at the timer or with a temperature selection switch. The dryer’s cycling thermostat is a very reliable bi-metal thermostat that rarely fails. This thermostat is normaly closed, allowing electricity to flow freely. When the dryer heats up it will open, breaking electrical contact to the dryer’s heat source and allowing the drum temperature to drop slightly, causing the thermostat to close again and reenergizing the dryer’s heat source. The thermostat’s operating temperature range is identified on the part with an “L” followed by the temperature. For example, L130 would open (cycling the dryer’s heat off) at 130ºF. A dash followed by another number, for example L155-10, would mean that the dryer thermostat would close after having cooled 10ºF. Faulty cycling thermostat symptoms could take the form of very high dryer temperatures, blown out thermal fuses, or no heat. The cycling thermostat works in connection with a thermostat heater to achieve lower dryer temperatures, such as low and medium heat settings. Test: Remove all connecting wires and test for continuity. There should be no resistance measured when the dryer is cool (a closed circuit, allowing electricity to flow). Cycling temperatures can be roughly calculated with a meat thermometer held next to the dryer’s exhaust duct. As the dryer heat source is cycled on and off, temperatures can be observed. The thermostat heater is often located within the cycling thermostat. However, it may sometimes be a separate component mounted to the dryer’s cycling thermostat. Depending on the dryer’s temperature setting, more or less voltage is supplied to this heater. Low settings supply more voltage and create more heat, while medium settings supply slightly less voltage, generating less heat. High heat settings will not energize the thermostat heater at all. In this way the thermostat is tricked into thinking that the dryer is hotter than it actually is, so it opens at a lower drum temperature. Problems with this system can occur when the temperature selection switch fails to send the proper amount of voltage to the thermostat heater, or the heater itself fails to heat the thermostat. Test: Remove all connecting wires and check for resistance across the heater contacts. Approximately 3200-4000 ohms of resistance should be measured. 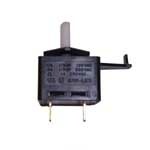 The dryer’s start switch is a momentary contact push switch that allows electricity to energize the motor. Once the motor has begun to spin, an expanding contact within the motor, called a centrifugal switch, expands to maintain contact after the start switch has been released. Some models that have a “finish guard” or “wrinkle prevent” option will automatically start the dryer from time to time after the dry cycle has ended to prevent the clothes within the dryer drum from becoming wrinkled. These start switches have an internal solenoid to activate the switch automatically without it needing to be manually pushed. This style of dryer start switch will have three contacts instead of two. Test: How-To Test A Clothes Dryer Start Switch Videos. Remove all connected wires and check for continuity across the two main terminals. While pressing the switch, there should be no resistance measured (a closed circuit, allowing electricity to flow). Three-wire dryer start switches can be checked in the same way. Look at your wire diagram or a chart on the switch for test points. The switch itself can be described in the same way as the above style, but the secondary coil contacts should give some resistance to activate the switch. The dryer’s timer routes electricity to the correct dryer components or system at the proper time. Timers are expensive, rarely fail, and are often misdiagnosed. The timer should be allowing electricity to flow to the dryer’s heating element and motor when needed. Test: Use your dryer’s wiring diagram to check for voltage being supplied to the heating circuit or motor circuit. The dryer motor is used to create the circular motion required to turn the dryer drum and blower. The dryer motor also completes an electrical circuit. Once the motor has begun to spin, an expanding contact within the motor called a centrifugal switch expands to maintain contact after the start switch has been released. Test: A motor can be checked for resistance across the start windings and main windings. The proper resistance levels and test points can often be found in your dryer’s wire diagram. In some cases a large amount of lint can collect on the motor causing it to over-heat. In other cases the contacts to the motor may become loose and not allow electricity to enter or leave the motor circuit. This can cause the motor to not run or other components to not work properly. If you have a “dead” motor you should also check the door switch, belt switch (some models), and timer before replacing the motor. A clothes dryer’s temperature selection switch is a simple switch that will send electrical current to the thermostat heater through resistors. Resistors are usually located on the wires connecting to the switch, but sometimes within the switch itself depending on your model. In this way the amount of current reaching the dryer’s thermostat heater is controlled. Some dryer models will use a thermistor and a separate solid-state control board to regulate the dryer’s drum temperature. The dryer’s temperature selection switch rarely fails. Test: Disconnect all connecting wires and check for continuity across the switch and all wire harness resistors. If you have a solid-state control board, visually inspect it for burn marks. Use your dryer’s wiring diagram for more accurate testing. A heating element is used in electric dryers to generate the heat needed to dry your clothes. Almost all heating elements require 240 Volts to function correctly. Sometimes the heating element can short, allowing contact to ground. If this does not trip the circuit breaker, it will effectively bypass the cycling thermostat and cause the heater to never cycle off as long as the dryer is running. Test: How-To Test A Clothes Dryer Heating Element Video. Remove all connecting wires and check for resistance across the two terminals of the heater. Some resistance should be detected allowing the heater to perform its work. If an open circuit is detected, the heater needs to be replaced. Also check each of the heater’s contacts to the outer containment unit of the heating element. There should be no connection. If the heater tests okay, check the connected thermostats for continuity and your home’s power supply for full 240-volt supply. Dryers use a blower wheel to move air across the dryer’s heat source and through the dryer’s drum. Airflow is extremely important for a dryer to operate properly. Air that is saturated with evaporated water must be removed from the dryer’s drum for more evaporation to occur. Not all blower wheels are the same, even though they all perform the same function. Fast clicking or buzzing noises are often an indicator that some object is grinding against the blower wheel as it turns. In some cases the blower’s connection to the motor shaft may weaken, causing the blower to rattle and shake, especially when you first open the door to stop the dryer. This can also reduce the speed at which the blower spins, cutting airflow and increasing the time required to dry a load of clothes. The belt transfers the power generated by the motor to the drum, enabling it to tumble. Belt sizes and styles are model specific. Test: Physically inspect the belt for signs of cracking or burning. The dryer’s door switch senses if the door is open or closed. When the door is closed the switch will close, allowing power to circulate through the rest of the circuit. When the dryer door is open the switch will open, breaking electrical contact to the neutral connection of the circuit and stopping the flow of electricity. Some door switches are “single pole double throw” meaning that when the door is opened the dryer’s main component circuit is open, but the dryer’s drum light is energized. Most often the actuator arm of this switch will physically break off. However, sometimes the switch will break internally with no external indicators. Test: How-To Test A Dryer Door Switch Video. Remove all connecting wires and check for continuity across the switch’s main component circuit. There should be no resistance measured (a closed circuit, allowing electricity to flow). Some dryer models use a belt switch attached to the belt tension pulley, which will open if the dryer’s belt breaks, not allowing the dryer to operate. Symptoms of a broken belt are similar to that of a broken door switch. The dryer will not start, or stops suddenly in the middle of a dry cycle. Test: How-To Test A Clothes Dryer Belt Switch Video. Remove all connecting wires to the belt switch and test for continuityacross the switch terminals. There should be no resistance measured (a closed circuit, allowing electricity to flow). The belt pulley (also called the idler pulley) keeps tension on the belt, creating the small amount of friction necessary for the belt to grip the motor and the drum. Dryer manufacturers have used a variety of belts and pulley designs through the years. Most methods of belt / pulley installation can be found on the dryer pulley installation page. The tension pulley can be responsible for some squeaking noises as well as causing the belt to burn. Other possible causes of these same symptoms could be drum supports, or any component that would make it difficult for the drum to rotate freely. The dryer’s drum can be supported by a number of methods. Some dryers use a rear drum bearing to support the weight of the dryer drum and wet clothing. Others use nylon or felt to pad the contact points between the dryer’s moving and stationary parts. These bearings can wear out and cause squeaking and scraping noises. In extreme cases, where loud dryer noises have been ignored for long periods of time, the motor may no longer be able to turn the drum and a humming noise will replace the grinding. Allowing grinding and squeaking noises to continue without repair can greatly increase the cost of repair. Dryers use several different methods and components to support the drum and allow it to rotate with ease. Most designs have a series of rollers that hold the drum in position and a felt material that reduces friction and creates a light air seal for proper airflow. Some manufacturers, such as General Electric and Frigidaire, use a single ball bearing that is mounted to the back of the dryer drum. This bearing turns within a lubricated nylon cradle mounted to the dryer’s stationary rear bulkhead. Some dryer models simply have pads that resist friction to support the drum and allow rotation. Any of these supporting methods can wear out over time and cause squeaking and grinding noises. Test: Visual inspection of all points of contact between the moving drum and stationary points is the best way to determine if one ore more components need replacement. A thermistor is a variable resistor that fluctuates the resistance it offers to a circuit with temperature change. In this way the thermistor can communicate with a solid-state control board and give very accurate temperature readings. The symptoms of a faulty thermistor could be an error code, incorrect dryer temperatures, or no heat. Thermistors have very specific resistance requirements that are usually listed on a technical sheet located somewhere inside your dryer. Test: To test a thermistor, disconnect all connecting wires and perform a resistance check. The correct resistance value must be identified for your model and can usually be found on your dryer’s wiring diagram or technical guide, located somewhere inside the dryer. There are two main types of moisture detection used in clothes dryers, electronic and automatic. The electronic dryer moisture sensing system is the most accurate and uses two metal strips somewhere in the dryer drum. When the dryness detection strips are bridged by wet clothing a timer within the dryer’s control board is reset to zero. For “more dry” options the timer may be attempting to count to 70 while for “less dry” it may only be set to reach 30. The automatic style of moisture detection uses the cycle thermostat to power the timers motor. In this way the timer motor only advances as the dryer is cycling the heat source. when the clothes in the dryer are wet this happens much more slowly and speeds up as the cloth dries. in this way the dryer can approximately detect when the clothes are dry. A dryer’s airflow system is as important as the heat that the dryer generates. A dryer can be as hot as Hades, but if the moisture-saturated air is not removed from the area your clothing will not dry. Clogged internal and home ducting is the number one cause of long dry times and poor drying performance. Disconnecting the dryer’s duct and running a test load will often solve long dry times. If the dryer now magically works, check the ducting for blockages. Dryer manufacturers often suggest limiting duct length to no more than ten feet, each 90º angle in the homes ducting is like adding 5 feet to its length. Vertical home ducting can also be a common source of clogged ducting and heating issues.